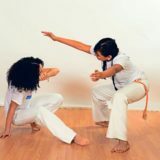 adults and minors, must read and complete an assumption of risk, understanding of Capoeira academy policies, and release prior to participating in Sinha Capoeira class. For convenience, the release and waiver can be printed by clicking here and completed prior to coming to class. Please submit the form during your first visit. Forms are also available before class.